Downloading max demand values to a spreadsheet file is simple with our recent firmware update, v3.3.10! 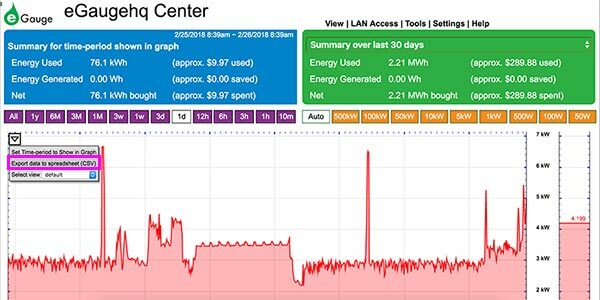 With this update, you can find the exact kW value, date, and time when the peak demand value occurred. Let’s walk through it step-by-step! First, navigate to your eGauge device page on a web browser. Once loaded, find the drop-down menu on the graph (it looks like a gray triangle), click it, and select "Export Data to Spreadsheet." Next, change Export Type to “Max. Demand Value (e.g., kW for power)”, select the date range for which you’re interested in finding a max value, and change the Interval to the rolling average you’d like to find. For this last part, utility companies typically charge based on a rolling 15- or 30-minute average, so in the export menu, choose type in 15 or 30 and select “minute” from the drop-down menu. Finally, click export! Open your recently exported CSV file in a spreadsheet program. You should see a Date and Time column followed by columns for all of your device’s registers. Remove any columns for which you don’t want to find a max demand value. In this example, we’ll just look at the total Usage register. 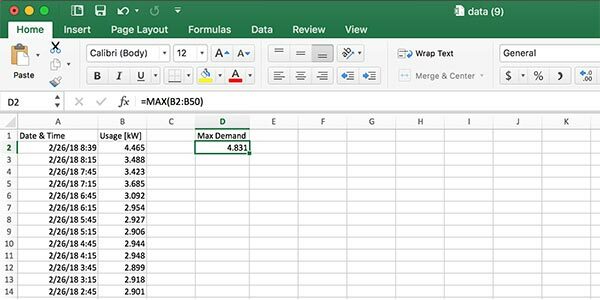 Next, in an empty cell we’re going to use a formula to find the max value, it’s called =MAX() in excel (other spreadsheet programs may use something slightly different). Put the range of your register column in this max function; it should look something like =MAX(B2:B50) when complete, hit enter. The output will be the max kW value in the range you selected! Now, you’ll probably want to know when the max occurred. The easiest way to do this is to ctrl-f (or cmd-f) the value and look at the corresponding date. This method becomes harder if you have a large number of columns on your sheet, but you can use a function like the VLOOKUP() to get the same information. This post should get you started exporting max demand values from your eGauge. If you’re curious how to see max demand in real time on your graph, check out this blog!